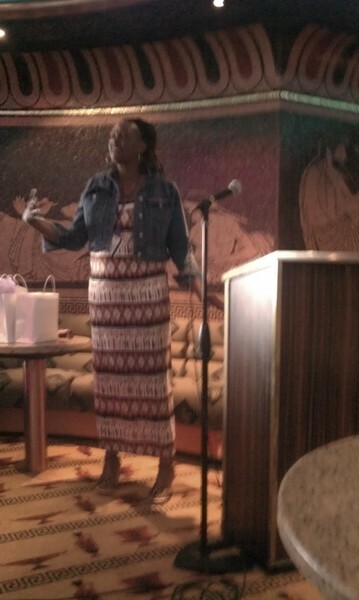 This year God gave me an unexpected, wonderful surprise: a cruise to the Bahamas while speaking at a women’s conference! What if there were a hurricane and I was drowned in the sea? What if the ship were knocked over by a giant tidal wave? What if I needed to get on the life boat because of some kind of emergency on the ship? What if I got on the lifeboat and it sank and I was eaten by sharks? I know, ridiculous, right? But fear is never rational. As soon as I told Ray about this, he said he thought I should go because it was a great opportunity. 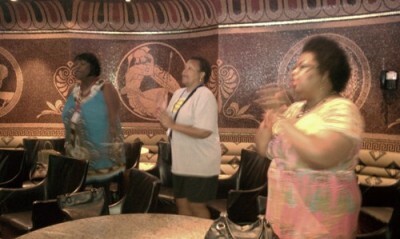 Well Watered Woman Ministries would pay for my cruise cost. I just needed the round-trip air fare to Miami, FL, and the hotel costs for the night before the cruise ship embarked and the night after I came back from the Bahamas. God would have to provide these costs ~ and He did, over and above my needs! God helped me to push past all my fears, and the trip was such a blessing! I’m so thankful to God that He chose me for this mission and I was able to go. 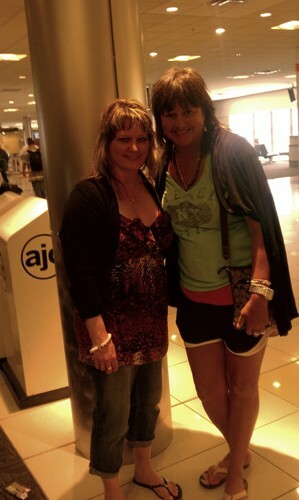 I loved meeting Tony, her prayer warriors, friends, and team members Kim and Tony, and all the women at the conference. God did great things that week. 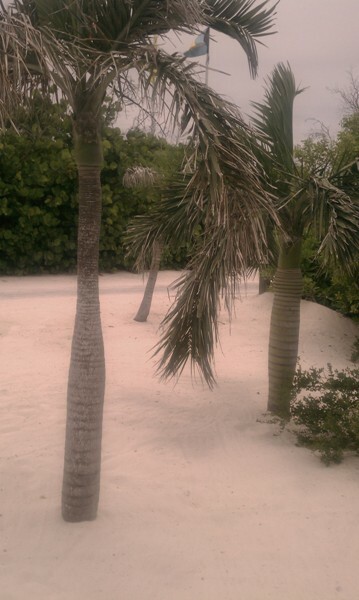 The Bahamas were breathtakingly beautiful. I was able to lay on the beach, swim in the exquisite blue-green Caribbean waters that you can see right through, and eat delicious food. 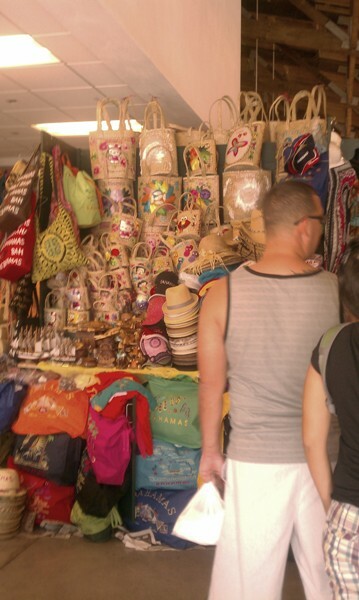 I loved shopping in the local markets in Grand Turk, Half Moon Cay, and Nassau islands. I even wrote an ebook about my adventures, Bahama Mama: When God Uses Ordinary Women For His Extraordinary Purposes! God’s presence was there with us at this conference. The women were touched and blessed. All the praise and glory goes to Jesus Christ! 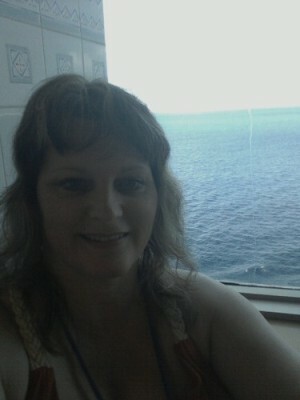 Below are a few pics from my cruise to the Bahamas. Tony is now planning another women’s conference in 2013, this time in Jamaica, which we all can’t wait to attend! You can find out more about the Triumphant & Victorious Conference by clicking here. Here is the ship we were on called Destiny. How awesome is that? It was HUGE! 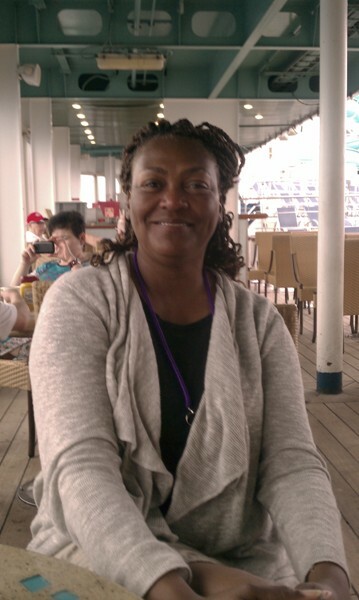 Below is Tony Robinson, the woman who asked me to speak on the cruise ship at her Women of Destiny conference. 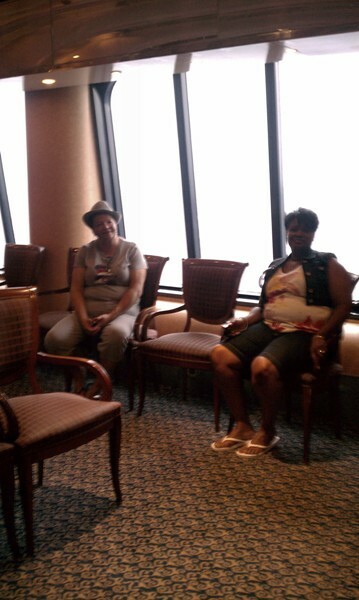 This is the morning after we embarked from Miami, FL. We had “coffee with God’ on one of the top decks of the ship, and while there Tony and I had a divine appointment with a man. God gave us words of encouragement to speak to him. He was clearly touched, with tears in his eyes. 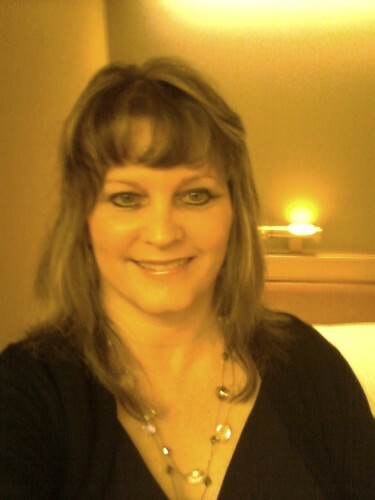 Tony is an anointed woman of God, and so sweet. I just loved her! 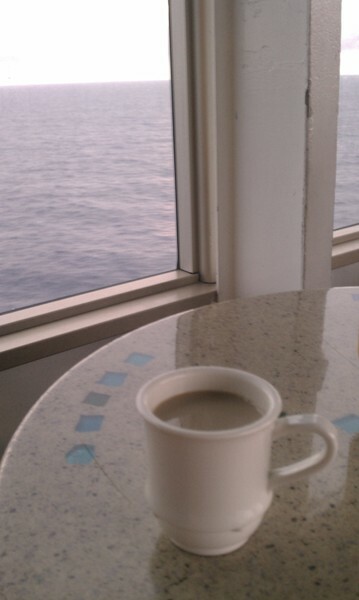 Below is my cup of “coffee with God.” It was so peaceful and relaxing on the deck, looking out at the ocean. God is so good! 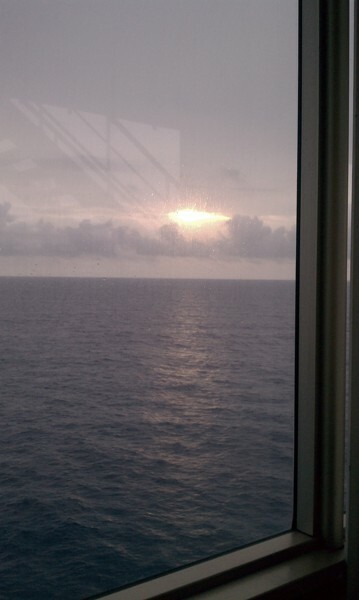 It was awesome seeing the sunrise from the top of the ship. Below are some of the women at the conference our first day. About 15 women attended the conference. The room I spoke in was a beautiful room with large glass windows, where we could look out on the ocean. God gave me the scripture prior to the conference and confirmed it with this ocean-view with Psalm 42:7, “Deep calls to deep at the noise of Your waterfalls; all your waves and billows have gone over me.” God wanted to speak to us the deep things of God throughout this conference – through prayer, His word, the ocean and beautiful Bahama islands, and His people! 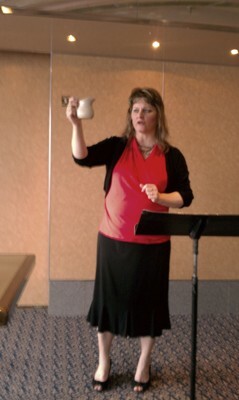 Below is a picture of me speaking at the Women of Destiny conference. I spoke about how the women had a great destiny from God and that He wanted to use their spiritual gifts inside of them for His glory. Below I am doing a book signing with one of the attendees, LaToya Gay, who purchased my book, The Hands Of a Woman: Everyday Women In Everyday Battles. 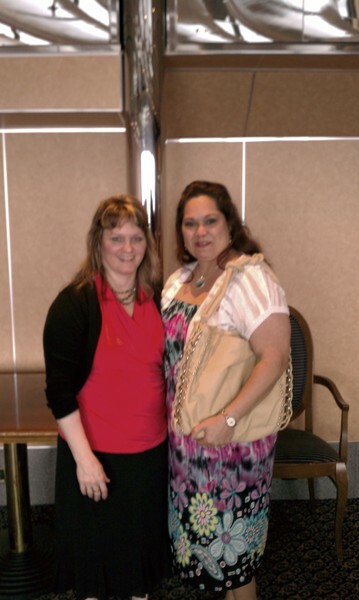 Below I’m pictured with one of the conference attendees, Carlette Jackson. Carlette was a sweet, wise woman and HILARIOUS. 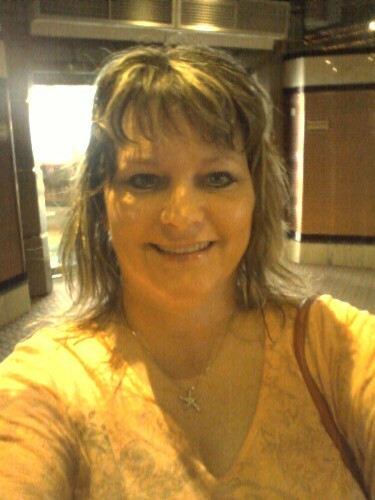 She was one of the “serial cruisers,” who had been on numerous cruises, and gave me great tips. 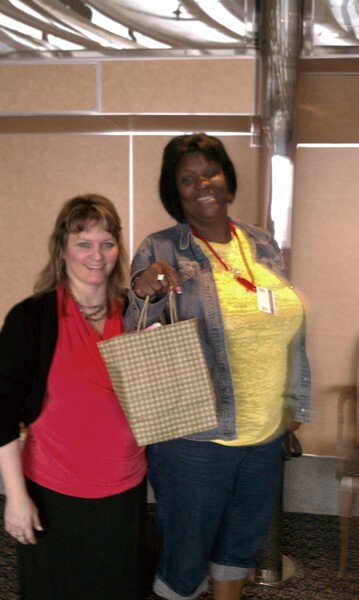 Below I’m pictured with one of the gift bag winners, Ana Muniz. 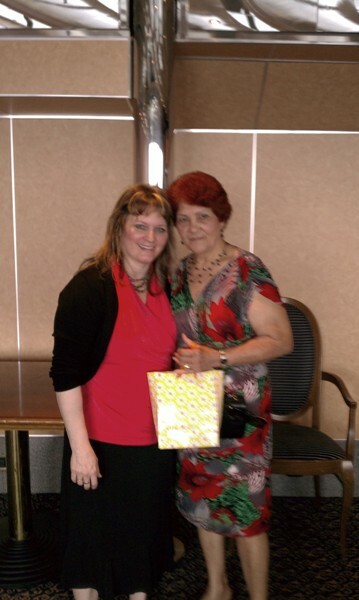 Ana was traveling on this cruise with her daughter Enid, who gave her this cruise as a gift. They were both such sweet women with hearts for God. Enid also has a heart for Mexican women to draw closer to the Lord. Below I’m pictured with Ana’s beautiful daughter Enid. 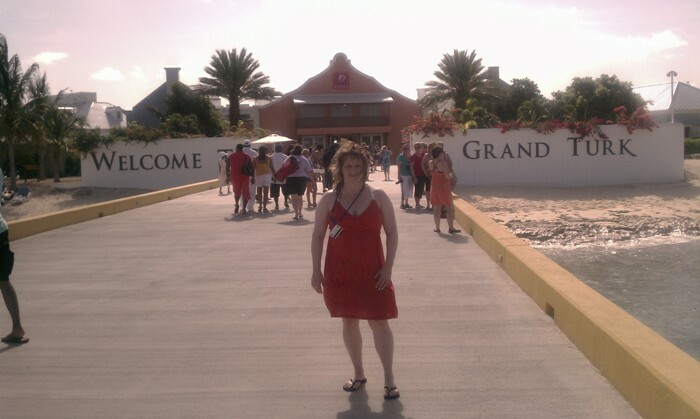 Below I’m at the border of our first port, gorgeous Grand Turk Island. The water is blue-green, so clear you can see right through it. Breathtakingly beautiful. I’ve never seen a beach as pretty as this one. As I lay on the beach, my toes sandy, listening to the sound of the ocean, feeling the sun on my face and the cool tropical breeze, all I could do was praise God in gratitude for His goodness to me. The sand is white and soft, with hardly any shells or rocks, so you can walk on it barefoot without it hurting your feet. Tony and I were both the keynote speakers for this conference. Below is a picture of Tony preaching the word on our second conference day. Whew, she’s a powerhouse for God! 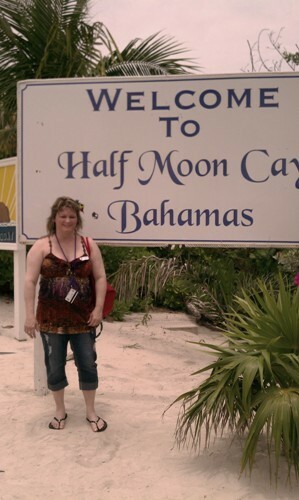 Half Moon Cay was our second port stop. 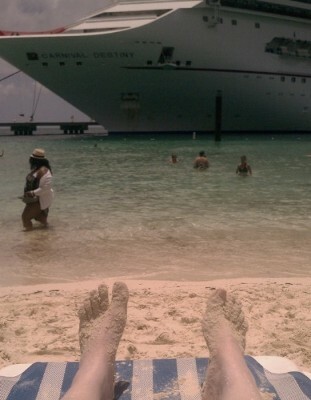 It is a private island, owned by Carnival Cruise Lines. 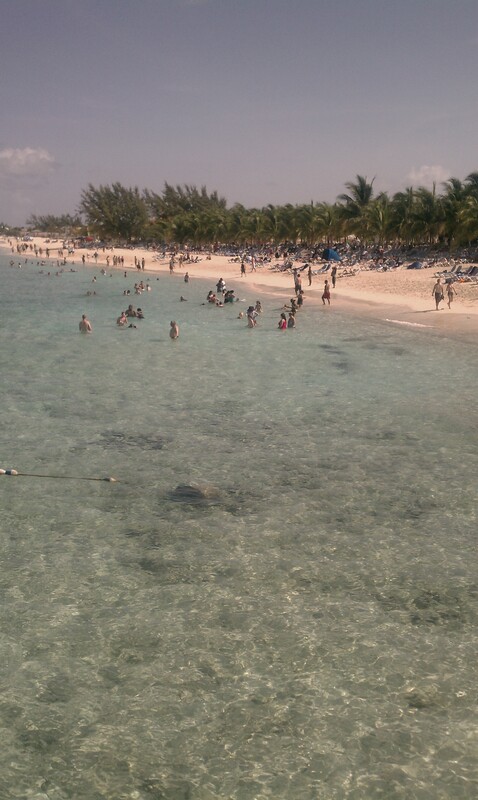 It was here that I asked God WHY He had sent me to the Bahamas. I hadn’t led anyone to Christ, healed the sick, or raised the dead. Was I just using God as an excuse to lay on the beach, eat good food, and shop in the local markets, to get away from everyone and everything? Then I heard God’s still, small voice as I walked around the island in my colorful tank top, new capris, and flip flops: “Beth, I want you to pray over the land.” God had sent me there to just pray? Yes, partly. The other part was meeting Tony, her team, and speaking the Word He gave me to the women at the conference. He’d also used me to talk one-on-one with two women attending the conference, sharing words of encouragement with them. But God also wanted me to destress, relax, and have FUN. Because that is the kind of God He is! 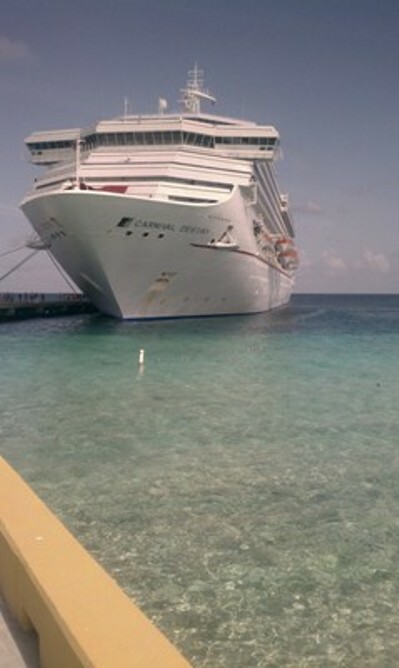 We had to take a small boat to get to our second port, Half Moon Cay Island. 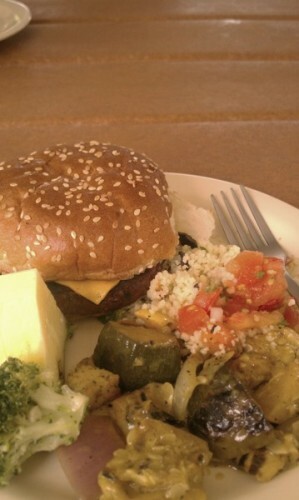 When we arrived, they fed us an “island bbq” of delicious, grilled food. 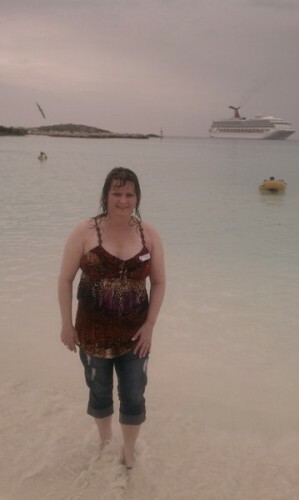 Below is a picture of me in front of the beautiful blue-green water at Half Moon Cay, after I’d gone swimming (and changed). The blue-green water and white sand make perfect backgrounds for photos. 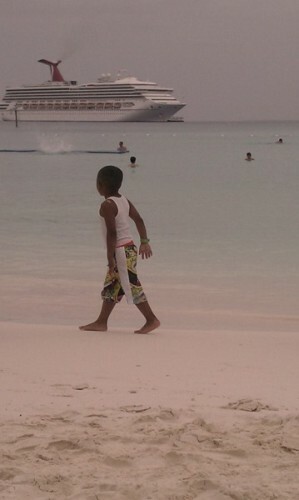 Here was a little boy on the beach, which made a great picture. Our ship, Destiny, is in the background. Nassau was our third port stop. It was alive and energetic, like a busy city with lots of dining and shopping. Below is a picture of Nassau’s popular “Straw Market.” I preferred the beaches in Grand Turk and Half Moon Cay, but had the most fun shopping in Nassau. 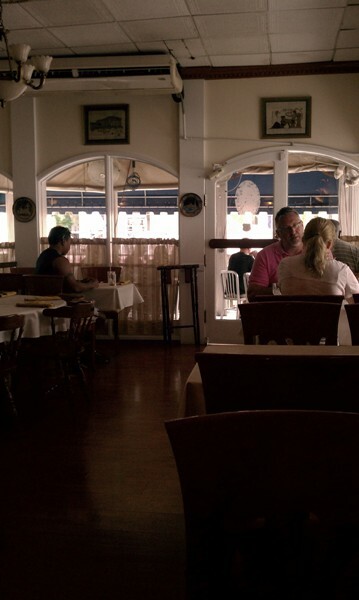 While in Nassau, I ate at a quaint Mediterranean restaurant. Mediterranean is some of my fave food, besides Mexican! It was delicious and the service from the polite, local resident was excellent. Musicians play on sidewalks and near the ports in the Bahamas. 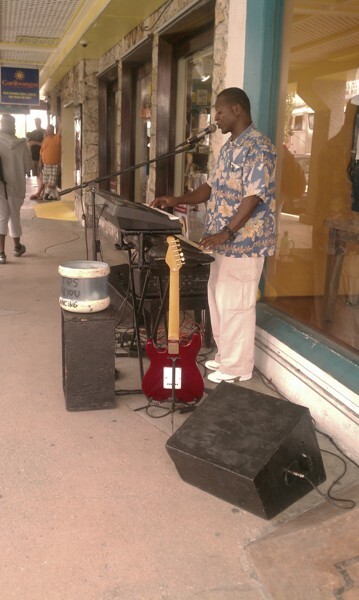 This man was playing a Reggae song on a sidewalk near the Straw Market in Nassau. They usually have baskets or jars nearby for you to leave them tips for the entertainment. For some of these musicians, it is their only source of income. 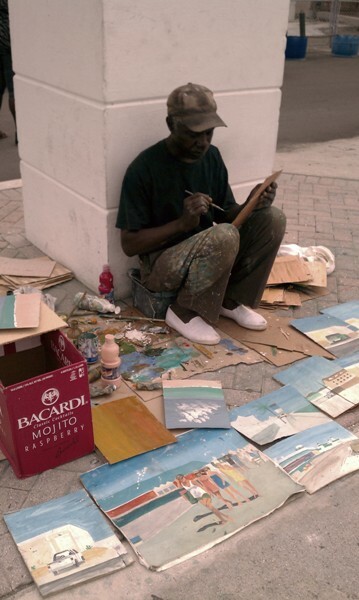 Below is a picture of a street artist in Nassau, using primitive tools for his paintings of people near the port. 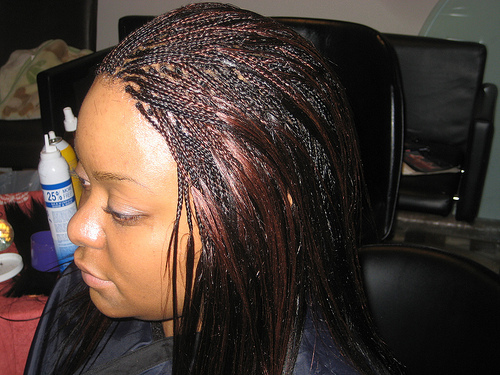 The local women in the Bahamas offer to braid your hair. This is one of their main ways of making a living, and it can be quite expensive. I had NUMEROUS Bahaman women offering to braid my long hair. As hot as it was, I politely declined. But it was interesting watching them braid others’ hair. One night we had a formal wear dinner in the main dining room. I wore a long, black dress with brightly colored flowers. This was a fun night for us all. I’d been challenged by someone to try conch shells while in the Bahamas. They are considered a delicacy. I did, which you can view on my YouTube channel (scroll down the page until you see the video). The conch is like a big snail. 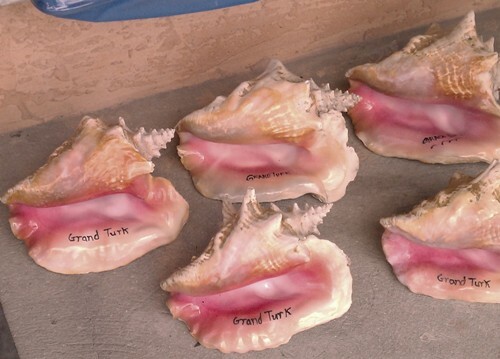 Below is a picture of their pink shells, which you can see for sale all over the islands. I’m so grateful to God for this adventure. Several years ago, I had prayed, “Here I am, Lord, send me.” And He did! It was an honor speaking at the conference, meeting Tony, her friends, and these wonderful women who blessed my life. The cruise was an anointed time of worshipping God, meeting with His royal daughters, and relaxing on the beautiful Bahama beaches. Will you say yes to God? Just watch and see what He will do! When I was at the Miami airport to come home, I met some Christian women at my gate and shared with them about my trip to the Bahamas. One of them asked about my ministry/business and bought my book, The Hands Of A Woman, which I had a copy of in my purse. To learn more about this exciting adventure in the Bahamas, click here for my Bahama Mama ebook, which includes video links and bonus audios. And it is only $5!